JERUSALEM (AP) — Israeli Prime Minister Benjamin Netanyahu was glowing as he stepped up to a podium in the backyard of his Jerusalem home to welcome U.S. Secretary of State Mike Pompeo to a holiday dinner. 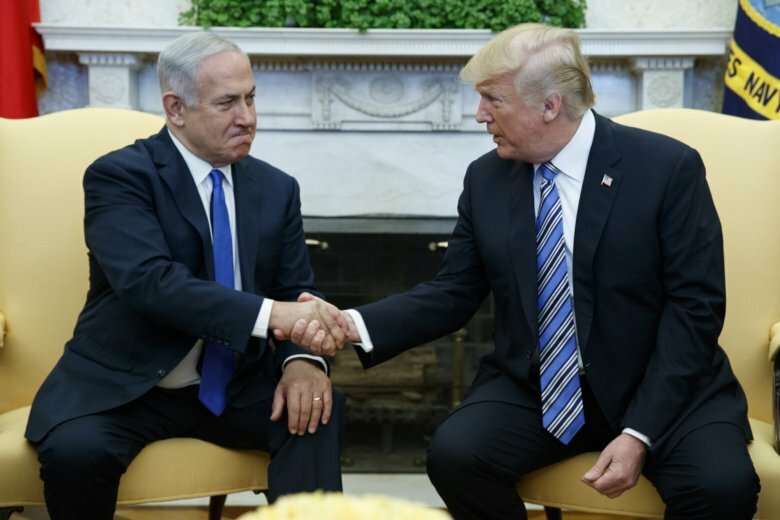 Senior U.S. and Israeli officials had been told privately that such an announcement was in the works, but that it wouldn’t come until Netanyahu visited Washington next week. The value of the Golan announcement for Netanyahu appeared obvious at the backyard podium at the Purim dinner. He exuded a confidence that belied whatever concerns he may have about a series of corruption scandals and looming possible criminal charges that have engulfed him in recent months and turned Israel’s April 9 election into an unexpectedly close race between him and a popular former military chief. Netanyahu has denied all charges. Their relationship will be on display again this coming week. Netanyahu will be in Washington for the American Israel Public Affairs Committee annual conference and will be hosted at the White House for a meeting and a dinner – his third trip there since Trump took over. He recognized Jerusalem as Israel’s capital, moved the U.S. Embassy from Tel Aviv, eliminated hundreds of millions of dollars in aid to the Palestinians, closed their representative office in Washington, and ended the decades-long practice of opposing Israeli settlement activity in the West Bank in what would be the core of a future Palestinian state. But their association has not helped Trump win over Jewish American voters, and has complicated Netanyahu’s relationship with the American Jewish community, who vote overwhelmingly Democratic. Many have expressed dismay over Netanyahu’s close ties with the president. Nearly all of the declared 2020 Democratic presidential candidates, including Elizabeth Warren, Bernie Sanders, Beto O’Rourke and Kamala Harris, have said they won’t attend the AIPAC conference this year, though other prominent party officials will be there. Jeremy Ben-Ami, president of J Street, a liberal pro-Israel organization, said the Trump-Netanyahu alliance has tested the committee’s traditional commitment to bipartisanship. J Street has encouraged Democrats who attend the upcoming AIPAC conference to use the stage to denounce Netanyahu’s hardline policies. “When your role as an organization is to support those in power, you end up getting dragged along,” he said.